Time for a Barça Overhaul! For the second year in a row, Barça crash out of the Champions League’s Quarter-Finals. The team has a few weeks of football left to try to win a domestic double. However, an overhaul is in order for next season. If there’s ever a line from a movie that is synonymous with FC Barcelona, it has to be the line uttered in The Dark Knight. “You either die a hero, or you live long enough to see yourself become the villain.” This applies to both managers and players. We have seen managers such as Cruyff, Rijkaard, Guardiola, and now Luis Enrique be admired only to be turned on by the fans. The same applies with players who were once worshipped but then left the club through the back door. At this moment, Luis Enrique is becoming the villain as the club fails to impress on the pitch. Today’s scoreless draw against Juventus was Luis Enrique’s final European match as a Barça manager and it ended with a thud. Just a few years ago, he witnessed his team score three goals against Juventus in the Champions League Final. Sadly, his side failed to score over two legs against Juventus this season. Both teams had the same two managers but the performance and results were such a contrast from back then and now. The manager and the board assembled this team full of expensive signings and what do they have to show for it? All these new signings and only Umtiti has shined. La Masia neglected for expensive signings who have failed to deliver. The short term goal of success over a long term plan of sticking with tradition that got them success has not paid off. Many Barça haters claim anyone can coach this team to success. 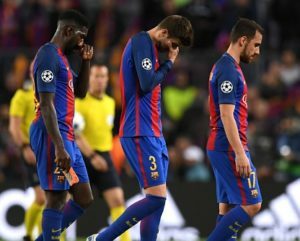 Well, for the third time in four seasons, and the last two seasons, Barça are out of the Champions League at the Quarter-Finals stage. Perhaps those who did not appreciate Pep Guardiola can now respect the difficult task of making it to four straight Semi-Finals, and two finals in three years. Luis Enrique’s baffling decision to start 33 year old smoker Jérémy Mathieu to keep pace with the speedy Juan Cuadrado in the first leg doomed Barça. Mathieu was abysmal just a few days earlier against Malaga and was taken off at halftime. Nonetheless, Lucho started Mathieu against Juventus in Turin and again had to take him off at halftime for Paco Alcácer. The damage was done and it was going to be tough to muster a comeback against this Juventus side. Lucho’s decision to bring on Mascherano for Sergi Roberto with twelve minutes to go was deflating. The side needed three goals and instead of bringing on Denis Suarez or even the young kid Alena, Lucho brought on a defensive midfielder. At least the team kept a clean sheet. With El Clásico just a few days away, Barça have their backs against the wall in a must win game. Anything else will make their quest for another league title futile. Juventus were the better side who were also better coached and will now face either Real Madrid, Atlético Madrid or the surprising Monaco in the Semi-Finals. Luck however is not on their side since the last four sides who eliminated Barça at this stage of the competition never went on to win the competition; Paris Saint-Germaine (1994-1995); Juventus (2002-2003); and Atlético (2013-2014 & 2015-2016). Barça will have an interesting summer ahead of them. The team is in need of an overhaul with more players being sold along with the signing of players needed in certain positions. The idea of assistant coach Juan Carlos Unzué or current Athletic manager Ernesto Valverde are a band aid option at best that fails to generate any enthusiasm. We need a manager from the Cruyff school, such as Oscar Garcia, who will pay attention to the youth and take the club back to the “Total Football” style that has been abandoned for this predictable direct, and also dull, football approach we have witnessed the last two seasons. Failure to hire the right manager will tarnish Sandro Rosell and Josep Bartomeu’s legacy as the men who inherited one of the greatest football teams of all time, if not the greatest, and allowed it to regress under their watch. Under their watch, they squandered a great squad and allowed Real Madrid to become kings of Europe in football and also in basketball. The idea of success now over a viable long term plan has failed and the right decisions need to be made this summer. The basketball team is already in shambles and we cannot afford to waste the talents of Messi, Iniesta, Pique, Luis Suarez and Neymar by not surrounding them with better players and a better manager. Next PostBarça defeat Real Madrid 2-3 with late Messi winner.